Gilles Fontaine was born in 1948 at Lévis, near Quebec City. In 1969, he obtained his bachelor’s degree from Laval University in Quebec City, and his doctoral degree in 1974 from the University of Rochester in the state of New York. He then took a postdoctoral position at the University of Western Ontario in London, and in 1977 he became a professor at the University of Montreal. Fontaine has specialized in the study of white dwarf stars since he first started his doctoral studies. A white dwarf forms when a star depletes its nuclear fuel. Deprived of this energy source, the star contracts and becomes much smaller, eventually dying as it slowly cools over several billion years. When the temperature of a white dwarf’s surface attains approximately 12,000 EC, the star begins to pulsate, causing variations in its luminosity. Asteroseismologists – scientist who study the vibrations of stars – can measure these changes in intensity with an instrument known as a photometer. There is a great interest for studying stellar vibrations because they allow scientists to obtain information about the internal structure of a star, and thus about its size, mass and composition. It is analogous to seismology, in which geophysicists study earthquakes as a means to probe the internal structure of the Earth. In 1981, Fontaine started up a research group that specialized in white dwarf asteroseismology, and his team would quickly become a hot topic in the media around the world. In 1982, only one year after forming, the team used mathematical models to predict the existence of a new type of pulsating star: the DB-type white dwarf. That same year, their prediction was confirmed by telescopic observations of a DB white dwarf. It was a first in astrophysics because, up to that point, new star types were discovered before being theoretically predicted. In 1987, Fontaine and his collaborators had the idea to determine the age of the Universe using white dwarfs. Since white dwarfs are very old stars nearing the end of their life, to determine their age would effectively estimate the age of the galaxy and – in the bigger picture – that of the Universe. In order to accomplish this goal, Fontaine designed numerical simulation models that weighted several parameters for a given star – such as mass, temperature and luminosity – and calculated the time that it would take for the white dwarf to cool. The age obtained for the Universe using this approach was 10 billion 300 million years. Recent re-analysis of cosmic background radiation has put this age at 13 billion 700 million years. In 1990, Fontaine published the first results within the framework of the Montréal-Cambridge-Tololo Project, which he helped develop. The main goal of the project was the systematic exploration of white dwarfs in the southern hemisphere. That same year, he also published the first results from the Whole Earth Telescope (WET) project he helped developed. WET is a network of telescopes positioned along different longitudes around the globe that can collectively provide uninterrupted observation of pulsating white dwarfs. 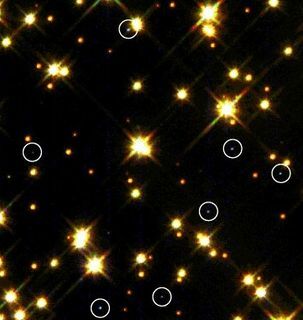 In 1996, Fontaine and his team once again theoretically predicted the existence of a new type of star, a B-type white subdwarf, and astronomers once again confirmed its existence, this time at the South African Astronomical Observatory in 1997. In the years since, Fontaine and his collaborators have continued to predict other types of stars. Fontaine received numerous distinctions for his work, including being elected as a member of the Royal Society of Canada. Asteroid 4230 is named in his honour. Gilles Fontaine explains what asteroseismology is. Asteroseismology is the study of vibrations in stars. Some stars – a small fraction of them – vibrate, or oscillate. It's the equivalent of an earthquake. The name "asteroseismology" comes from this analogy with "terrestrial seismology": the study of earthquakes. The idea is to use the same mathematical tools as geophysicists, but to probe the inside of stars instead.